Scientists have finally been able to find out the secret behind the chameleon’s ability to change their colors miraculously. They do not rely upon pigments to do the magic changing act, as was earlier believed and mange to do so by playing with light with the help of photonic nanocrystals present in their skin. The upper layer of the chameleon skin hides beneath a layer of cells that interact with light and also protects these lizards, which have for long befuddled scientists, against the harmful rays of the sun. That makes the color changing act in these lizards closer to mirroring, making them every different from other animals like cephalopods, including the octopus which can switch their skin tone. A team of scientists led by professors Michel Milinkovitch and Dirk van der Marel who species of chameleons called the panther chameleons found that these wonderful creatures have a thick skin embedded with active nanocrystals. Called the iridophores, these crystals give these lizards the ability to reflect specific wavelengths of light, making the onlookers feel that they can camouflage themselves. The scientists used spectroscopy, the study of the interaction between matter and light, to observe changes in the skin of the panther chameleon species which is found in the Madagascar. The nanocrystals, they observed, are arranged in a triangular lattice and made up of guanine, one of the building blocks of DNA. The male members of this species can do so within a minute or two, and they make full use of their ability to do so to attract another female or while trying to outdo a male panther while they are vying for a female’s attention. 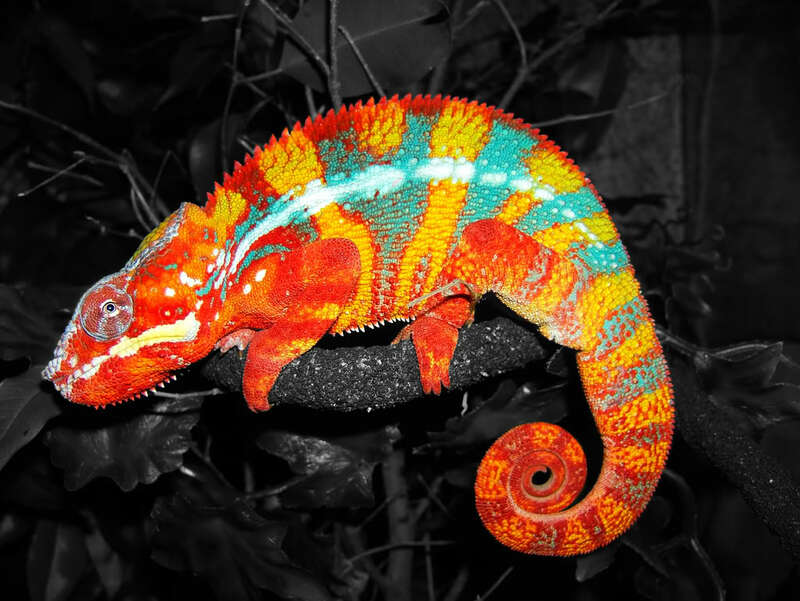 The structure of these cells present in their skin allows the chameleons to selectively reflect light of various wavelengths, like blue, or brown, yellow, and red. So instead of absorbing, or playing with pigments, the lizard depends on optical interference, “a result from interactions between certain wavelengths and nanoscopic structures, such as tiny crystals present in the skin of the reptiles,” says Milinkovitch. “They are like selective mirrors. Light will bounce on them only for specific wavelengths. … The other wavelengths will not bounce on these cells,” he elaborated. The panther chameleon, because of its ability to change colors dramatically within a few minutes, is really difficult to spot when out in the wild. It can change from a reddish orange to a cool blue within a minutes to hide itself or when competing with a male.